Why are Data Notebooks/Folders Important? How are Data Notebooks/Folders Developed? Data notebooks (or folders) support students in becoming coproducers of their learning. They help students organize processes for learning. The notebook generally contains a student’s mission, goals and action plans to support classroom and personal learning. Data notebooks or folders empower students to become accountable for their learning. By writing goals/objectives based on actual course or subject objectives, students have control over their pace of learning. Goals/objectives are also written by students to capture short-term gains to motivate themselves to achieve long-range goals. As with classroom data centers, analyzing what is working or not working provides timely feedback to the student to correct the course of action, as needed. The notebook also documents progress that can predict course grades, providing "no surprises" at the end of each school quarter or semester. Data notebooks are constructed in a way for students to observe short-term gains, a powerful motivator to achieve long-term goals. With tools to manage learning, students are provided with the means for self-empowerment and motivation. The development of data notebooks/folders mirrors the process for creating the classroom data center. Students write their individual mission statements based on their own needs, aligned with the classroom mission as closely as possible. Students formulate their personal goals/objectives and action plans based on curricular and stakeholders expectations and individual needs and missions. Students create data charts to monitor progress of each goal/objective. The contents of the data notebook may also include subject or course expectations and goals/objectives. Students may also include quality tools such as force-field analyses to determine"drivers” and “preventers” in achieving goals and PDSA models to redirect learning processes. 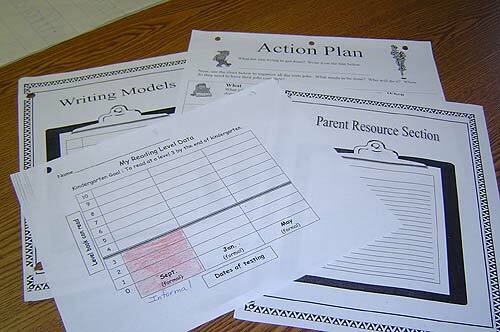 A section of the notebook is devoted to parent communication to keep parents informed on at least a quarterly basis and also provide parents with the opportunity for input. For more information regarding data notebooks, see the handbook for teachers, My Job, Your Job, Our Job: Building a Classroom Learning System, available to MCPS staff members through Dr. Michael Perich, Coordinator, Systemwide Continuous Improvement. For others, the document may be purchased through Dr. Perich. There is a fee of $15.00 plus shipping and handling.